Relatively larger herds require a more standardised approach for udder health management. This book digs deeper into the subject than the basic edition. More attention is paid to standard operating procedures, since the farmer often works with personnel. And extra pages about immunology of the udder are added. Practical prevention - seen from a farmer's perspective. With a structured approach, a dairy farm can achieve and maintain first rate udder health. 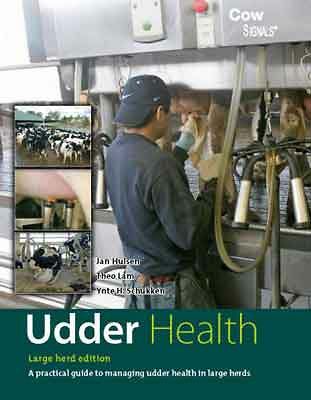 Udder Health contains the building blocks for optimal organisation of housing, care and management. It follows you, the farmer, through your daily/weekly/monthly and annual routines, since udder health should not be regarded as separate from other activities on the far. This edition pays extra attention to large dairy farms. After all, a systematic approach to udder health on those farms is even more important. Putting into practice set goals and signaling/monitoring problems are described extensively. this way they can be tackled systematically. Do you know how to organise milking so that it takes the minimum time and runs smoothly and consistent with each cow? Do you know how to treat a cow with udder problems? Or how to overcome a cell count problem? In the end it's up to you, but this book is an invaluable starting point. 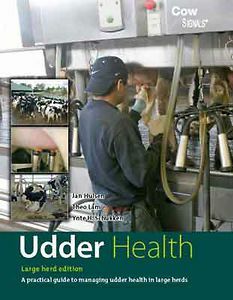 Its practical text, problem solving flowcharts and clear photos and illustrations make Udder health an accessible and interesting guide for every dairy farmer. The practical advise it offers will help you improve the understanding of udder health on your farm and achieve higher standards.